DisObey is a film that is a direct result of the Leverhulme and Arts Council funded residency at the University of Lincoln Schools of Law and College of Social Sciences, with the City of Lincoln. Throughout this residency I interviewed lawyers, criminologists and academics about their relationship with the law, asking them to consider their person and professional experiences and opinions, to define and explore their interpretation of the meaning of the words citizen, civil liberties, crime, criminality, free speech and the law. In total I recorded over 50 hours of interviews with 17 people. The research was conducted between April 2015 to April 2016. During this time I undertook extensive periods of both, face-to-face interviews and archival research. The research was primarily carried out within the Law School, College of Social Sciences and the School of Fine and Performing Arts, as well as with users of a drop-in centre for the homeless and unemployed, located at St Mary Le Wigford Church adjacent to Lincoln Station. Alongside this research, I spent a considerable period of time looking at and identifying archive film material from the Media Archive for Central England (MACE), based at the University of Lincoln. MACE collects private and public film footage relating to the heritage and more contemporary life of the East and West Midlands. My focus was concentrated on the rejected editorial cuttings from television news footage, largely the civil unrest that occurred across Central England in the summer of 1981, with particular attention paid to a series of National Front Youth Marches throughout the 1980s. This material was recorded by Central News but never edited, nor broadcast. These archive films have provided some of the visual foundations for the film Obey. The interviews themselves raised many interesting issues and the final film, DisObey, asks challenging questions about the construction of our current society, including the nature, function and value or our laws and legal systems and how they are understood, enacted and deployed today. Of particular note are considerations around our relationship to free speech, the rights of the individual and the nature of protest in a post-911, terror-aware, developed nation with a long history of social democracy and democratic processes that has been founded on the notion of free speech and the right of the individual. The film itself, DisObey features Jason Warr, a criminologist from the University of Lincoln. Jason’s heavily edited narration discusses the nature of free will for individuals and our individual and collective, social responsibility within the construct of our current legal system. 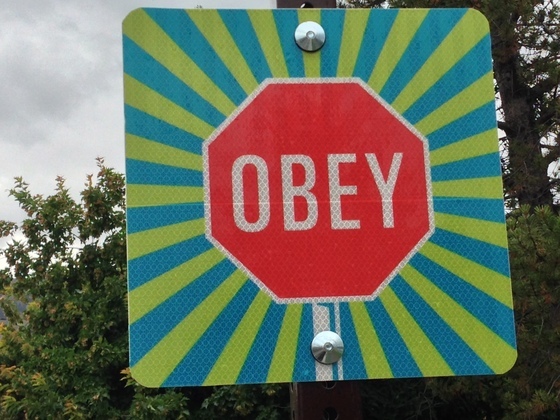 In the film Obey, Jason calls for a re-ordering of society, a re-working of our existing practices and a recognition that we as a society need to change our behavior radically in order to create a society that is truly fair and just for all. The film DisObey was produced for presentation in a public venue in Lincoln in November 2017, as part of the celebrations on the 800th anniversary of Charter of the Forest. It is hoped that the work will subsequently tour to other cities in the UK and abroad.